Reek Sunday pilgrims have been challenged in their faith, just as they are being challenged physically by the rough slopes of Croagh Patrick. Archbishop Dr Michael Neary and Bishop Fintan Monahan of Killaloe are among the thousands of pilgrims climbing Croagh Patrick today, a pilgrimage that has been undertaken for over 1,500 years. On Saturday evening, Archbishop Neary celebrated Mass in St Mary’s Church, Westport, to mark the official beginning of this year’s pilgrimage. During Reek Sunday, Mass will be celebrated at the summit of the mountain every hour, beginning at 8am, with the final Mass commencing at 2pm. Bishop Monahan will celebrate Mass at 9am; Fr Francis Mitchell will celebrate Mass as Gaeilge at 10am and Archbishop Neary will celebrate Mass at 11am. Pilgrims may also take part in the Sacrament of Confession from 7.30am to 2pm. While the arduous pilgrimage was long seen as one of the acid tests of continuing practice throughout the country, it was always far more than that, the Archbishop of Tuam said. He reminded pilgrims to be questioned by their faith. “We need that encounter as never before, as individuals and as Church,” he said. Archbishop Neary lamented that the educational system “makes fewer and fewer bones about the socio-economic goals of learning, and there is less and less value placed on knowledge for its own sake and wisdom as an end in education”. 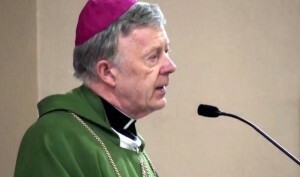 Archbishop Neary underlined that the Church in Ireland still has a special calling today. “To return, for the umpteenth time in the repeated ebb and flow of its long history, to penance and prayer”. To begin yet again that historical process of Christian discernment which has at its heart the attitude of listening “to what the Spirit is saying to the churches”. Could it be that we yet have our best work to do? he asked. He suggested that this work will be done by a small, socially and politically peripheral and poorer Church. Such a Church would be one which has rediscovered through adversity the honesty and authenticity of the suffering servant, the prophet, the abandoned Messiah. The senior bishop said that just as once church leaders were consulted and heard in the most powerful circles, “now we must get used to preaching on street corners and making the Gospel heard over the incessant hubbub of the public square”. He concluded that the Church must “subvert the closed shop that is the modern, western world view … and startle that careful, calculating world with the unaccounting largesse, the generosity, the hospitality of God”. Pilgrims were also invited to keep families and the World Meeting of Families in their prayers, ahead of the papal visit in August. Croagh Patrick (2,510ft/765m) is Ireland’s holy mountain. It dominates the landscape of south-west Mayo both spiritually and physically. The pilgrimage is associated with St Patrick who, in the year 441, spent 40 days and nights fasting on the summit, following the example of Christ and Moses. The name “Reek Sunday” comes from Patrick’s ability to Christianise many pagan customs including the festival of Lughnasa, which previously had heralded the start of the harvest festival honouring the ancient pagan god Lugh. Lugh’s name is encompassed in the Irish word for August: Lughnasa. This festival’s tradition became absorbed into the new Christian beliefs and locally become known as Domhnach na Cruaiche (Reek Sunday).